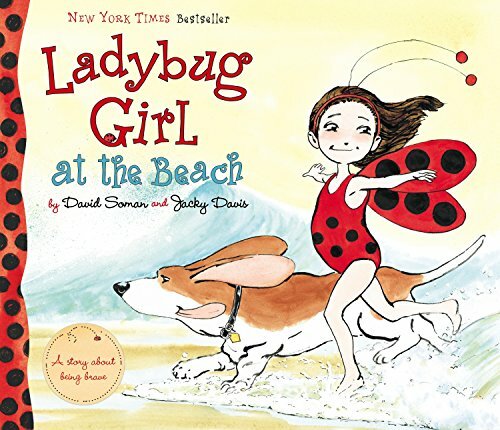 Ladybug Girl at the Beach stars a girl named Lulu who feels confident about her family’s trip to the beach. Even though she has never been to the beach before she knows that she is going to love it. Then reality hits. When Lulu walks to the edge of the splashing sea she does not feel so sure about going in, especially when a crashing wave slams the beach, the water sucking back out into the sea, nearly taking her and her Basset Hound Bingo with it. The roar of the waves and the roughness of the ocean deter her from enjoying the water, so Lulu focuses her attention elsewhere. She builds sandcastles and flies a kite, picks up shells and gets ice cream, but it isn’t until her favorite pail begins to wash away that she realizes what she must do: conquer her fear of the water. In the Ladybug Girl series, Lulu’s ladybug persona helps her overcome every obstacle she faces. Each book in this series focuses on a different scenario. The first book in the series, Ladybug Girl teaches the reader about imagination and empowerment. Book 2 in the series, Ladybug Girl and Bumblebee Brother, teaches children about friendship and compromise. The third book in the series, Ladybug Girl Dresses Up, covers dress-up and imagination. This series is designed to empower girls, demonstrating to them their (often hidden) inner strengths. Turning into Ladybug Girl gives Lulu the power she needs to conquer her fears. In that way she is comparable to a superhero. When a superhero is in costume, he or she is imbued with all the qualities needed to overcome any problem, accomplish any goal. Strength, courage, patience, compassion, understanding—just name a few of these qualities. Ladybug Girl is the superhero in her stories. She lets other children know that it is okay to be afraid of the unknown, and yet it is imperative to find the strength and courage to stand up to our fears. The artwork in this series is charming and well illustrated, bringing Lulu, the Ladybug Girl, to life. Girls from the ages of 4–8 years will delight in this 40-page hardcover picture book.